Place whole red peppers on a baking sheet, drizzled with a little olive oil. Roast for 20 minutes on one side, then rotate every 10 minutes or so until the skin on all sides has started to blacken and blister. Remove from oven and allow to cool for 20-30 minutes. While the peppers are cooling, prepare the other ingredients. Chop the onion, shallots, and garlic and prepare the herbs. In a large stock pot, heat the olive oil over medium heat. While the oil heats, quarter the peppers and remove as much of the skin and seeds as you can. I don’t recommend rinsing them, however, as it washes away a lot of the flavorful juices. When the oil is hot, add the onion and shallots and sauté until translucent (5 minutes or so). Add the garlic and sauté a few minutes more, until it begins to get a little color. Add the peppers and the tomatoes, stirring to incorporate the liquids. Add the paprika, black pepper, red pepper, rosemary, and thyme. Bring to a simmer and cook for 5-10 minutes. If you like a thinner soup, you can add some vegetable stock at this point. Remove from heat and carefully spoon soup into a blender. You’ll need to do this in batches. Blend until smooth. 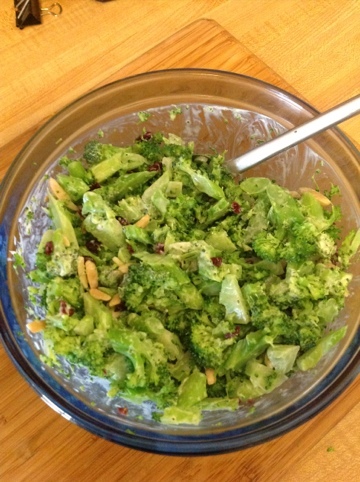 This quick broccoli slaw has become one of my go-to staples in the last several weeks. It’s quick to make and keeps well for about a week in the fridge. I usually take a container to work for an afternoon snack, or reach for it when I get home from the gym and can’t wait for dinner. I’ve never been a big fan of slaws in general, but I really like the lightness of this one. The ingredients are simple, but it has a really nice play of sweet and savory favors and a great combination of textures. Enjoy! Get some water boiling in a medium saucepan. Break or cut the broccoli into individual florets, leaving the stems attached. If you have to cut off the bottom of the “trunks,” cut them into pieces roughly the same size as the rest of the broccoli. When the water has come to a boil, throw in the broccoli and blanch for 2 – 2 1/2 minutes, depending on how crunchy you like it. When it’s done, drain it in a colander and run cold water over the broccoli for a few minutes to stop the cooking and set the color. While it’s cooling, chop your cranberries into smaller pieces and add them, along with the slivered almonds, to a large bowl. Now being chopping the broccoli, cutting it as finely as desired. While you do this, you can singe this song. For more of a traditional slaw texture you can use a food processor, however I found that it holds up better of the course of a week if the pieces are larger. I like to cut the stems on a diagonal so they can soak up the dressing. When all the broccoli is chopped, add it to the bowl, along with the sour cream and mayo. Stir so that everything gets well mixed, and add salt to taste.